Ford will start shipping its first electric passenger car to dealers this weekend. About 350 Focus Electric cars will be sent to 67 dealers in California, New Jersey and New York over the next couple weeks. Manufacturing executives signed off on the decision on Friday. Each dealer will get about six cars, one of which will be a demonstration model, the people said. Ford declined to comment to Reuters on the news. The people asked not to be named because the plans are confidential. 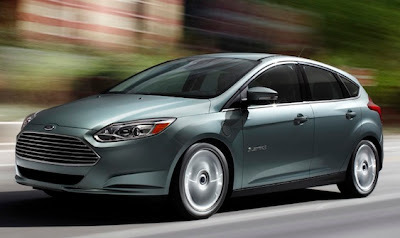 "We are still on track to begin shipping the Focus Electric this spring," Ford spokesman Wes Sherwood said. The Focus EV will compete in the burgeoning electric vehicle market against Nissan's Leaf and General Motors Chevrolet Volt. In April, Chief Executive Alan Mulally said he would not consider it a failure if Ford sold fewer than 5,000 Focus EVs in its first year. In the first four months of 2012, GM sold 5,377 Chevrolet Volts, while Nissan sold 2,103 of its Leaf electric cars. Both vehicles were launched in late 2010. Ford expects hybrids, plug-in hybrids and electric cars will represent up to 25 percent of its sales by 2020, with hybrids accounting for the majority. Because it is difficult to forecast what consumers will prefer in the future Ford have modified its Focus platform to build electric and gas-powered versions on the same assembly line. Ford's move differs from by both GM and Nissan, which build different platforms for the Volt and Leaf. Electrifying the platform allows Ford to maintain "reasonable margins" on its EVs, which tend to be costly because of the price of the battery, Mulally has said. The battery used in an all-electric vehicle, such as the Focus EV, can cost between $12,000 and $15,000. That would represent around a third of the Focus Electric's overall price of around $39,000.